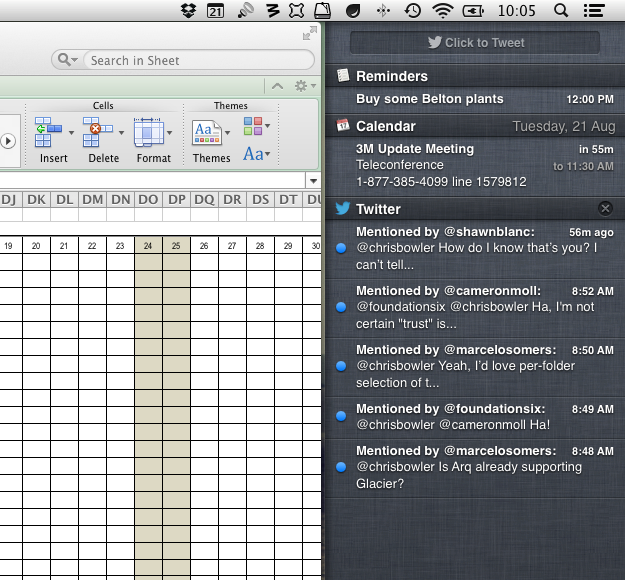 I find a strange dichotomy with the direction of iOS, and correspondingly, with OS X. The push for focus, for embracing the constraints of iOS, where you can only work in one application at a time, has been a welcome change for me. Having this direction partially come over to OS X has also been positive (I say partially because full screen mode doesn't stop me from swiping between spaces, but only slightly alters my perception of my work environment). The contradiction comes with the Notification Center. It's sole purpose is to distract, to disrupt the focus that the OS has given you. I find the difference between the two concepts striking. It makes sense that this comes to me now, after having used Mountain Lion. One would think I would have seen the difference previously, on iOS. But on my phone, Notification Center makes a lot more sense. The device is a satellite, not my primary tool for work. And some of the notifications are instant messages or phone calls, which indeed often deserve the attention required to break my focus. My phone is often also a consumption device. So the opportunity to distract is at worst a very minor nuisance and at times, a necessity. On my Macbook Air, the same is not true. Notifications have proven to be nothing but a nuisance. Anyone found a way to disable it completely? Let me know. Update: thanks to @atestu for the tip on how to disable Notification Center in Mountain Lion.